If the eyes are the window to the soul, then throughout history we’ve been obsessed with the curtains. From Ancient Egypt to worldwide use today, our eyelashes have consistently been subject to enhancement. Accenting the eye can protect from the elements, embolden our gaze, prove our social status, or be a part of makeup as play. If it includes gluing tiny pieces of hair to the tiniest hairs on our face, then so be it. Below, ten moments in time that mark significant advances in the falsifying of our lashes. The or “it girl” of the mid-Victorian era used paint to whiten her face, rouge to blush her cheeks, color her lips, to line her eyes, and false lashes to enhance her eyes. This look was bemoaned by conservatives during this era as it conflicted greatly with their vision of women having “natural” beauty.A woman who went by Madame Rachel who may have been considered one of the first make up artists of that time, claimed she was well paid for “enameling” a lady’s face. This was considered as “living lies” and “the instrument of deception” by conservatives such as the Chambers brothers. In 1919 makeup artist Max Factor enhanced actresses Phyllis Haver’s lashes which really helped false lashes go mainstream. He did this by sewing real hair onto her own lashes. For the movie Intolerance, Director D.W Griffith requested Factor for the false lashes in hope to create the effect of actress Seena Owen’s lashes “sweeping onto her cheeks.” Making false eyelashes popular were Factors early experience as a wigmaker and movie makeup artist, giving him all the glory to this day. 4 // It’s the 30’s – Girls Go Wild! Vogue magazine recommended blue mascara for grey-haired ladies and eyelash “irons”, known today as eyelash curlers, to assist with the “bewildering length” which was requested by women in the early 30’s. 5 // Did Grandma Have a Pair? In the 50’s false eyelashes were widely used. Glamorous bombshells were said to wear them both day and night, often using a full set for night and separating them into individuals for day use. Making it more popular among the masses was the popularity of film stars and growth of big beauty brands. The minimal make up look was popular in the 90’s! A natural beauty in a slip dress, butterfly hair clips with hair hair combed through, light mascara (we’re thinking of you, Drew Barrymore), was the look.Makeup artist and author The Art of Makeup and Face Forward Kevin AuCoin, was an expert who applied false eyelashes to celebrities to completely transform their look. “Spiky sets– lashes that were clumped together were used at the latter part of the era turning supermodel Christy Turlington into Marisa Berenson’s twin! 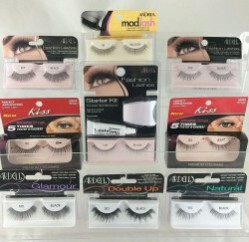 Individual lashes could also be applied along the lower lash line as well. Hilary Swank would use a full set to transform her into a dead-ringer for Raquel Welch. In 2001, J-Lo’s flew in her Red Fox Fur lashes by make up guru, Shu Uemura, to wear for the Academy Awards, causing controversy due to the material and expense. Luxe lashes became a catalyst for Uemura’s opening for the Tokyo Lash Bar, a high-end counter with seasonal lash collections, in 2004. Celebrity J-Lo flew in her Red Fox Fur lashes by make up guru, Shu Uemura, to wear for the Academy Awards in 2001. That caused controversy due to material and expense. in 2004 Luxe lashes became a catalyst for Uemura’s opening for the Tokyo Lash Bar, a popular high-end counter with seasonal lash collections. 9 // So Shu Me! Mink lashes with diamonds (again by make up guru, Shu Uemura) which cost $10,000 were worn by Madonna in 2009. Only 1000 pairs were produced until they were sold out. Successful make up artists such as Peter Philips, bedazzled models in the Fall runways by decorating the lash front with tulle and sequins for Chanel. Models for Dior, Milan’s Dolce & Gabbana and Versace flaunted outrages fluttering lash lengths, creating a high demand that season for falsies. Lashes made of feathers, mixed materials, or ones with self-adhesive lash bands are constantly being featured in editorials these days and extravagant pairs of lashes as appealing as high heals as well. Lash Bars are now springing up in urban centers providing lash-only services from lash-dying, application, to extensions. False lashes are at their peak and are available to anyone from drugstore chainstores, beauty supplies, salons, makeup studios and online stores.